The VMBV Mid Series Segmented Vacuum Manifolds are individual vacuum pump segments with a common air supply that provides independent vacuum to multiple locations. Segments can be individually configured or they can all be the same. All segments offer integral NC solenoid control for vacuum creation. For added functionality, specify a valve for blow-off and a vacuum switch/sensor for part present/vacuum achieved feedback. Design flexibility is further increased with our interchangeable venturi cartridge system that allows designers to optimize performance by choosing from 11 venturi cartridges. Large internal flow paths allow ingested debris to pass through the segments without clogging. Push-to-connect air supply and vacuum lines save space and assembly time. ** Please contact Vaccon Technical Support or your local distributor for assistance in configuring Venturi Segmented Vacuum Manifolds. Installation instructions with dimensional data for the VMBV Mid Series Segmented Vacuum Manifolds is presented in 2D drawings, with all critical dimensions and port thread sizes displayed. Both imperial and metric units are included. 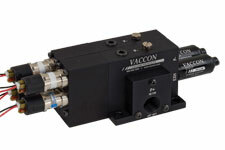 Performance data for the VMBV Mid Series Segmented Vacuum Manifolds is displayed, listing air consumption, vacuum flow at various vacuum levels, and evacuation times (for 1 cu. ft. or 1 L volumes). Data is presented in tabular and graphed formats, in both imperial and metric units.